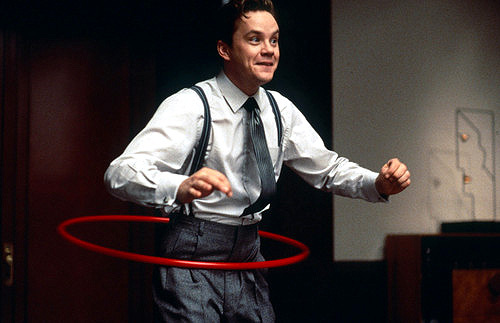 Norville Barnes (Tim Robbins), a recently graduated business major, makes his way from his hometown of Muncie, Indiana, to New York City to "make it big." He winds up working in the mailroom of the monolithic Hudsucker Industries, whose CEO, Waring Hudsucker (Charles Durning), has recently committed suicide. On the day he is hired, Norville is given the task of delivering an important letter to Sidney Mussburger (Paul Newman), the second-in-command at Hudsucker Industries. In the process of bungling the delivery attempt, Norville winds up as president of the company, with a neat idea that he believes will turn the company around--you know, for kids. Accidental Pun: "I wasn't expecting all this hoopla." Almighty Janitor: involves a brawl between two of them, either one capable of freezing time for the rest of the universe. And There Was Much Rejoicing: Hudsucker's death, for quite a few people. He had just jumped when Mussburger (his Vicepresident) took the cigar he had left behind and started to smoking it, procaiming it would be a shame to "waste a Montecristo". Moses: Strictly speaking, I'm never supposed to do this. But have you got a better idea? Catch Phrase: "You know, for kids!" Chekhov's Gun: The blue letter. Deus Ex Machina: Oh, so very much. After over an hour of film about business practices, Norville's attempt to kill himself is stopped when an Almighty Janitor stops a clock, thus STOPPING TIME, and giving Norville time to talk to the (deceased) ex-CEO. Dream Sequence: A hot one, too. Hey, It's That Guy! : God Bruce Campbell as a sleazy newspaper reporter. Martin Crane as God's Bruce Campbell's editor. Anna Nicole Smith's first film appearance in a cameo. Wow, Sandy Cohen can really sing! Steve Buscemi cameos as the bartender at the beatnik bar Amy frequents. Motor Mouth: Amy occasionally, but most prominently the mail room orientation guy. Also, Buzz. On One Condition: Hudsucker left his shares of Hudsucker Industries to the first person to be named as the company's CEO after his death. Rhymes on a Dime: Hiya buddy, the name's Buzz, I got the fuzz, I make the elevator do what she does! Serious Business A very literal example. The scene showing an ironic amount of Research and Development that went into designing a circular piece of plastic. From blueprints with just a circle on them to an army of accountants to decide the MSRP. Shout-Out: Jennifer Jason Leigh's performance is a direct reference to Rosalind Russell's role in His Girl Friday. Also, several references to Metropolis and 1984 particularly the more recent version. Moses: And that's the story of how Norville Barnes climbed waaay up to the forty-fourth floor of the Hudsucker Building, and then fell all the way down but didn't quite squish hisself. You know, they say there was a man who jumped from the forty-fifth floor? But that's another story (storey). Time Stands Still: Time miraculously stops when a broomstick jams the gears of the clock tower, allowing Norville to survive the fall from the Hudsucker building ledge, have a chat with the angel of the late Mr. Hudsucker in mid-air, and learn that the company is all his according to the infamous Blue Letter...yet the snow never stops falling. Unexpected Inheritance: Near the end, Norville Barnes learned that, as the first CEO of Hudsucker Industries after Hudsucker's death, he inherited Hudsucker's shares of the company. This page was last edited on 24 May 2017, at 19:53.